With aging, the paint becomes dusty and not resistant. 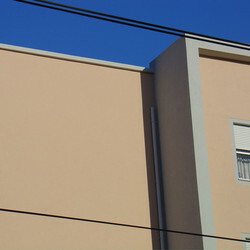 Under UV exposure pigments will be destroyed and will damage the aesthetical aspect of the facade. Severe weather may damage the polymeric structure of the paint and lead to peeling and debonding. · In case of old dusty paint, remove as much as possible with high water pressure, 120 bar. · If not well bonded then remove completely the paint with a special paint remover or by burning and then apply primers and finishes with weberpas product range. · If only discoloration but resistant paint, apply the primers and finishes with weberpas product range.